A historic First World War sound mirror is set to be uncovered by the National Trust on the White Cliffs of Dover after planning permission was granted this month. 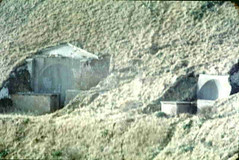 Sound mirrors were one of the first early warning devices invented in the UK to give advanced notice of approaching enemy aircraft and were a precursor to radar technology. They were themselves a component of a larger network of observation posts which made up the first early warning system in the world – the London Air Defence Area (LADA). Recent archaeological surveys have confirmed that the First World War sound mirror, along with a second dating from 1920-1929, survives buried under Fan Hole on the iconic White Cliffs in Kent. It was unknown if both sound mirrors had been demolished in the 1970s until they were rediscovered by the National Trust and local archaeologists on 3 May 2014. Dating from approximately 1917, the First World War sound mirror is the oldest surviving in Kent and one of the earliest known operational sound mirrors to have survived anywhere in the UK. Work to uncover the sound mirrors, currently buried under around 600 cubic metres of spoil, has now started and is expected to finish in early November. Uncovering the 15 and 20 feet high concrete lined structures, which is so technical that it’s classed as engineering works, will be undertaken by three archaeologists and a team of over 50 volunteers, with all spoil pulled up the steep sides of Fan Hole to be removed. Once uncovered the sound mirrors will be assessed and any necessary conservation work undertaken. Jon Barker, visitor experience manager at the White Cliffs comments: “With one dating from 1917 and the other being a slightly later prototype, the sound mirrors are a significant national discovery and we hope that visitors will be as amazed as us at their survival. To have rediscovered them both and to now be uncovering them is something which our team here will never forget”. Records survive showing that the older of the two sound mirrors was in use during the First World War to detect incoming aircraft in 1917-18. The development of radar in 1935 put an end to sound mirror technology and many fell into disrepair. Those on the White Cliffs were eventually buried by the council in the 1970s as part of a campaign to clear up the local area. The excavation work, which has the consent of Natural England, will restore native chalk grassland to the area, by removing the rubble and debris that was used to bury the sound mirrors, and has since prevented the natural habitat from thriving. The restoration project will initially result in some areas of bare chalk, but these will soon return to downland turf with its wide range of wildflowers, butterflies and other species. Jon Barker adds: “During the feasibility study we discovered conflicting information about the survival of the sound mirrors with some records suggesting that they might have been demolished or tipped over. It was therefore very exciting when preliminary archaeological surveys showed that the top of both mirrors survive in relatively good condition. We are all very much looking forward to restoring a once prominent feature of this iconic landscape”. Keith Parfitt, a local archaeologist from Canterbury Archaeological Trust, also comments: “I have known the area since I was a teenager and remember seeing the sound mirrors before they were buried in the 1970s. It is still a matter of deep regret to me that so much was demolished in Dover during this time, so it has been very rewarding to help the team at the White Cliffs rediscover the sound mirrors this year. I am thrilled to see the work go ahead and cannot wait to stand on the landscape and admire the sound mirrors once they are fully exposed; they will be a real point of interest for visitors”. During the works, which are expected to take four weeks, members of the public are being asked to share any historic photos, video footage, anecdotes or memories of the sound mirrors, particularly from the Second World War or 1970s, with the National Trust. Contact the local team at White Cliffs of Dover by emailing whitecliffs@nationaltrust.org.uk or calling 01304 207326. Both sound mirrors are located on land purchased by the National Trust in 2012 after a successful public appeal raised £1.2million in 133 days. The project to uncover them has been part funded by a Landscape Heritage Grant, given by the Heritage Lottery Funded Up on the Downs Landscape Partnership Scheme. It has also been supported by donations from Subterranea Britannica an archaeological society which studies underground sites. The Nick’s Digs archaeology website has photos of the Fan Bay sound mirrors being uncovered: “It may not be unlocking the past of pre-history but as excavations go they have to be pretty special to be as interesting as that of Fan Bay deep shelter and its lost sound mirrors“. They have a website about the project.